Opinions of a Moody Mama: Good Nite Lite Review & Giveaway! 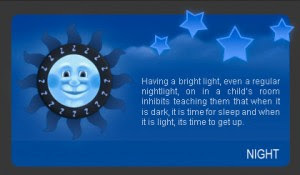 "The objective of the "Good Nite Lite" is to educate children to stay in bed until it is morning. 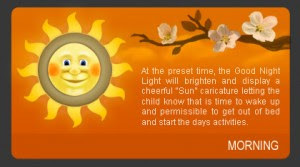 Children between the ages of 3 and 5 years of age are just starting to grasp the concept of day and night and how it relates to regularly scheduled rest. The Good Nite Lite can assist children with better differentiating the concept of nighttime and daytime and reinforce the benefits of appropriate sleep patterns. The Good Nite Lite device itself is an innovative combination of a traditional night light and a built in timer that changes the visual display characteristics to reinforce a regular sleep pattern. " It almost never fails, Cooper wants to wake up before the crack of dawn on the weekends. I have tried everything I know of to get him to sleep in, but everything seems to backfire on me. When I received the Good Nite Lite, I was very eager to give it a try. The Good Nite Lite is made so that parents can choose the time that the Moon Face will shine, as well as set the wake up time, when the Sun Face shines. So far, it seems to be working well. I explained to Cooper that when his light changes to the blue Moon Face, that means it is time for bed. Going to bed has never really been a problem at our house, so that was the easy part. Then I told Cooper that it was not time to wake up until his light changed to the Sun Face, which I set for 7am. So far, it actually seems to be working. As a matter of fact, this morning, I woke up to my son telling me "The sun is on, Mommy! Time to get up!". I think the Good Nite Lite is a very easy, practical way to help teach your child proper bedtime and wake up times. I would recommend this product for any parent with a child who has trouble with bedtimes, or who has an early riser, like I did. BUY IT! You can buy your own Good Nite Lite at http://www.goodnitelite.com/. WIN IT! 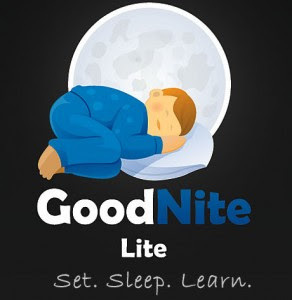 Good Nite Lite has generously offered to give one lucky winner their own Good Nite Lite! Tell me about your bedtime troubles! Do you have trouble getting your child in bed, or do you have an early riser? Follow me on Twitter and tweet about this giveaway! (Leave your Twitter name and a link) You can tweet this daily: " Good Nite Lite giveaway at Opinions of a Moody Mama #giveaway @coopersmommy http://tinyurl.com/2cg6dv2 "
Uh - BOTH! He likes to stay up late and still wakes up early. Apparently my husband was like that as a child and my dad was so apparently I lose. This clock just may work though! My daughter has a little one that insists on getting up at the crack of dawn! I remember that my kids would do that too. I think she would love to try this! The kiddo is only 11 months right now. When she's not teething, she's pretty easy to get to bed and recently she's started sleeping later. I think this will be great once she gets a little older (and especially Christmas morning!). We have an early riser, and we don't have problems with getting our daughter down for bed, but our main problem is having her stay in bed -- she's up many times each night! my daughter likes to fight sleep, she will literally just lay there, with her eyes open, until really late! My son never wants to go to bed. He just becomes more crazy until you finally give up and lay down with him to make sure he stays in the bed. He also just turned 3, so I would really love to try this night light out on him. Oh, I have been wanting one of these. My son usually sleeps good in the morning but getting him to go to bed is a battle every night! I think this would be helpful. I have kids walking around the house at 3am. My son takes forever to fall asleep so he is not an early riser but every month or two he will get up super early - 4 am or so and can't fall asleep until the time he should be getting up. this product might help. My 3 year old boy won't fall asleep in his own bed. I have to let him pass out in mine and then carry him to his own. My daughter stays up half the night. She says she just can't fall asleep. I am also a night owl so it must be in the genes. It is very hard for us to get our 4yr old sleep in his bed. He always wants either my husband or I to sleep with him. A nite lite would be great to try. My problem is my toddler does not want to sleep in his room. He wants us to move his bed to the living room. I have a very early riser . This would be great for our family. My son goes to sleep well but tends to be an early riser so this would be great for us! My problem is my dachshund that keeps me up burrowing in my blanket every night. Definitely we have an early riser-she thinks 3:30 am is time to get up! We have a two year old that wakes up very early. We also have a 8 month old that wakes up early too because of the two year old. I seem to always have trouble getting my little boy to sleep. I usually have to wake him up in the morning. I voted for you on Mommies Faves Top Sites. Entry #2. My third child, my son Walter, is up at the first hint of sunlight. My husband tells me that he was the same. No real bedtime issues except that we had to switch the lock on his door because he is in a toddler bed and comes out of his room instead of napping! My baby is a great sleeper- so good that he doesn't want to get up in the a.m.
Just recently we have been able to put her in her crib at night as she is attached to her tigger stuffed animal. But for naps, she wants to be next to me, which can be a pain when I fall asleep with her instead of doing cleaning or school work. She also is a very picky sleeper. She will only sleep in the car and at home in our bed. She won't sleep on the floor, in her stroller, carrying her or sorts like that. My son wakes up way to early...it seems the later he goes to bed, the earlier he wakes up. My son has always been an early riser. And has always been up by 5am. Even if I allow him to sty up late. I am a fan of Good Nite Lite via Facebook as Jill Myrick. Both kids get up before 6am! I haven't slept in in over 4 years! We used to have both, but have fixed going to bed now so that she isn't up for two hours just playing instead of sleeping. But she still wants to get up early! We have a very early riser. She doesn't understand when she can get up and sometimes she crawls into our bed at 4 am. I have one child that is an early riser and another that just loves to sleep. My 3 year old goes down seamlessly, it's the wake up time that's a problem. This kid is up at 5am everyday! We have been looking for something to help with the behavior modification, and this looks perfect! I liked the Good Nite Lite on FBook. I liked the Good Nite Lite on FBOok! My daughter is a night owl and has trouble sticking to a routine, this would be such a fun bedtime ritual! My daughter is 2 1/2 and ever since she climbed out of her crib at 23 months, we have a kiddo who wakes up WAY too early. We haven't found a solution to the early wake up, kiddo in our bed problem. Don't mind the kiddo in the bed every once and awhile, but every morning as soon as the sun rises, is a bit much :) Would love to try out this nightlight with my daughter!! Our bedtime trouble is my kids like to sleep with the hall light on. I find it hard to sleep with so much light coming into my bedroom. My son never wants to get to bed! I have a child who does not like going to sleep at night, and now matter how late he is awake, he's up WAY tooo early. Thanks for the chance to win! My daughter hates going to bed at night, she got used to a tv being on (my bad) and it takes forever to get her asleep at night without one! bedtime is not too bad, we have a routine and we stick to it. i think that it's important to be consistent with children, so they know what to expect. My son is an early riser. He wakes up at 5 am and then wakes his baby sister up because "it is wakeup time". I really wish he would sleep later in the mornings because I am never ready to go at 5. Mine don't like to go to bed but do sleep in usually. My youngest two have trouble getting to sleep and then major issues with staying asleep!! I'm not too worried about them waking up early as I am normally up at 6, but just getting them to sleep is a major hassle! My son gets scared at night because he has to sleep in a room all by himself.